SWISSFLEX is the world’s lightest polymer eyewear and guarantees absolute wearing comfort that lets you forget you are even wearing eyeglasses. Depending on the style a pair of SWISSFLEX eyeglasses weighs between 2.0 and 5.0 grams. 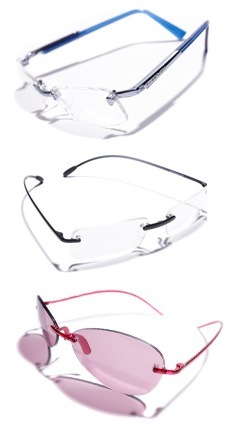 You can choose among countless glass shapes for the rimless frames. For a detailed shape selection please contact your local SWISSFLEX representative, he will be happy to show you the range of shapes. For the half rim and full rim frames the glass shape is specified. Swissflex is known for its advanced rimless concept in eyewear: barely there rims and no-frame styles ranging from conservative to cutting edge. The customizable, versatile, and stylish frame line includes a variety of rimless glasses, as well as a sun wear collection that combines a lightweight high tech polymer (HTP) material with a highly evolved mounting system. SwissFlex is noted for its geometric design that incorporates screwless, hingeless, flexible plastic temples. SwissFlex Frames are offered in an array of vibrant, modern colors with an unlimited choice of lens shapes. 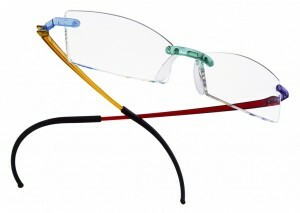 Swissflex continues to add new colors, shapes to their well-established Rimless frame.